Your Apple Watch interacts with your iPhone really well, and has probably reduced the number of times that you need to perform certain tasks, or check your phone for new notifications. One of the more useful notifications on the Apple Watch is the one that is sent for a new text message. You may have found that you can reply to these messages, but that you only have the option of using a few generic replies. While these can cover a lot of situations, there may be certain phrases that you often use with your friends or family that you would like to be able to send from the watch as well. 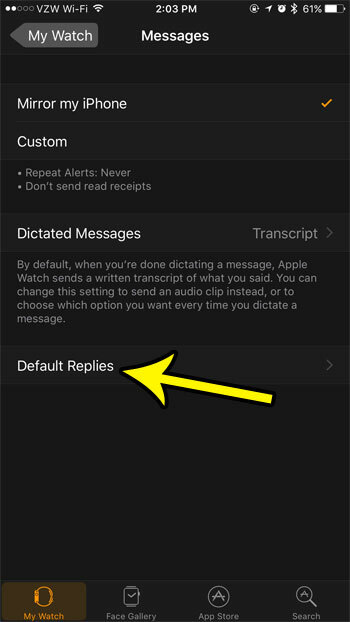 Our guide below will show you how to add custom default replies that you can send from your watch. The steps in this article were performed in the Watch app on an iPhone 7 Plus in iOS 10.3.3. 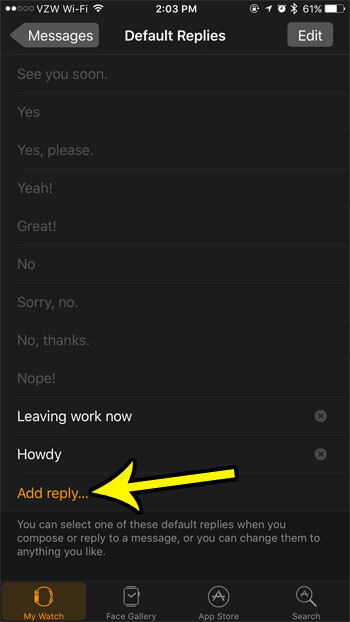 Completing these steps will create a new default reply that you can select and send directly from your watch. 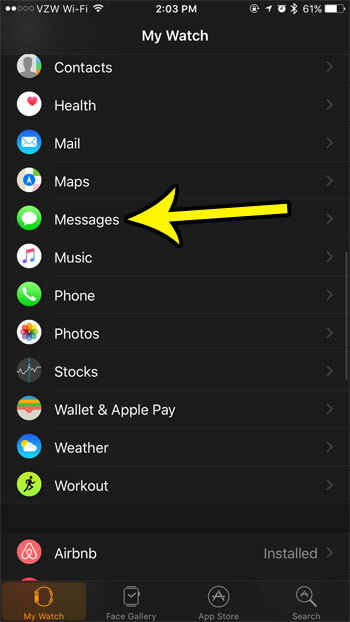 Step 3: Scroll down and select the Messages option. 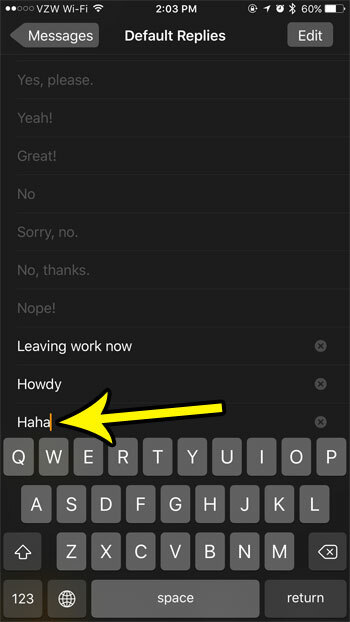 Step 4: Touch the Default Replies button. Step 5: Scroll to the bottom of the menu and tap the Add reply button. This is going to create a blank space above the button. Step 6: Tap inside the blank space you just created, then type the default reply that you wish to add. Press the Return key when you are done. Tired of the constant reminders on your watch that are telling you to breathe? Learn how to disable the Breathe reminders on your Apple Watch if you find that you are always dismissing them instead of completing the Breathe exercise. Where is My Folder Pane in Outlook 2013?